Today’s heavy-lift Ariane 5 flight with the Star One C4 telecommunications relay platform and MSG-4 meteorological satellite has entered the final countdown at the Spaceport in French Guiana. 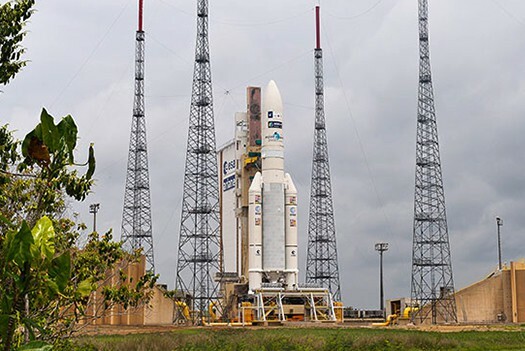 Liftoff is scheduled this evening during a 37-minute launch window that opens at 6:42 p.m. local time in French Guiana for this Arianespace flight in service of two long-standing customers: Embratel Star One and Eumetsat. 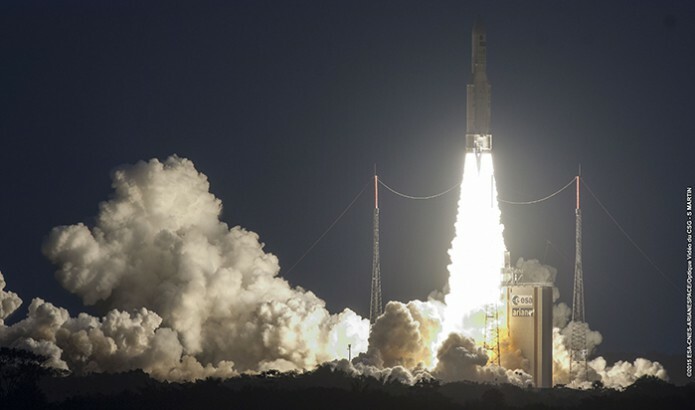 Embratel Star One’s Star One C4 satellite – which was designed and built by SSL (Space Systems/Loral) – is the 10th satellite Arianespace has launched for the Brazilian operator during a relationship that extends for 30 years. Star One C4 features 48 Ku-band transponders and is to reinforce direct-to-home services in Brazil, while expanding access to other Latin American countries, and the mainland United States. MSG-4 is the fourth Meteosat Second Generation (MSG) spacecraft and the 12th satellite to be launched by Arianespace for Europe’s Eumetsat. The Thales Alenia Space-produced MSG-4 is part of a series of geostationary satellites that plays a critical role in ensuring the safety of lives, property and infrastructure by supporting the now-casting and short-range forecasting of high impact weather. Today’s mission is third flight of Ariane 5 this year, and the sixth overall mission from French Guiana across Arianespace’s complete launcher family – which also includes the medium-weight Soyuz and light-lift Vega vehicles.